“If I knew the last time that I held you was the last time…. Tomorrow is not promised, Right now is the only guarantee you have. A statement that is so easily forgotten. Tomorrow is taken for granted. Something we just expect to be there. Last week the blogging community was shaken by news from Jennie Perillo of In Jennies Kitchen; her husband Mikey died from a sudden heart-attack. Leaving Jennie and their two daughters behind. My heart also broke for Jennie, a woman I’ve never met, a woman that doesn’t live near me, a woman I havn’t talked to other than a few back and forth comments on twitter……….all in the same… my heart broke for her, and her daughters. Losing my husband is something that I don’t know if I could handle. He is my best friend, My Rock in this life. Without him I’d crumble. When he was in the Military, it was something they prepared us for when he deployed. I am thankful I didn’t have to use my answer. 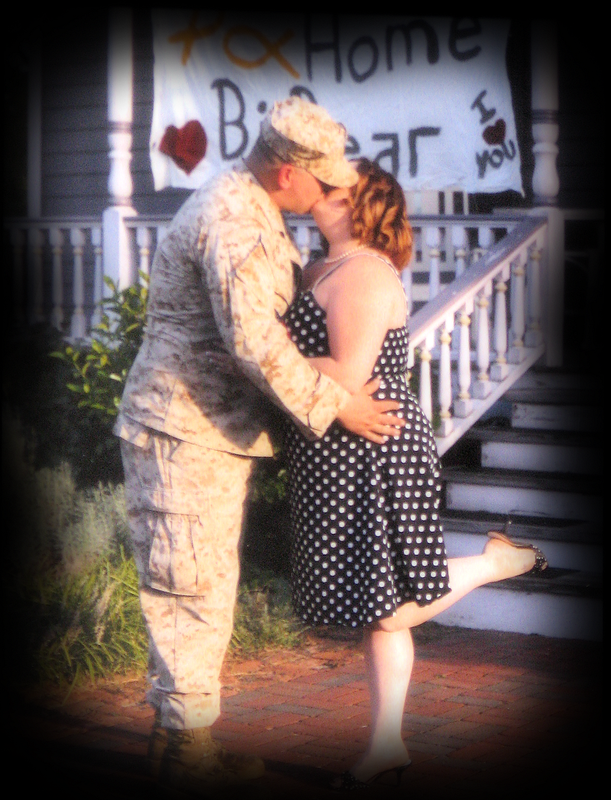 I am thankful that my husband came home safely, even though I heard news often of the husbands that were not. I knew it was true… the statement… “Tomorrow is Not Promised”…the military drilled that into my head, but hearing Jennie’s news brought it fresh into my mind. Jennie said it was Mikey’s Favorite. So today, that’s what I did. 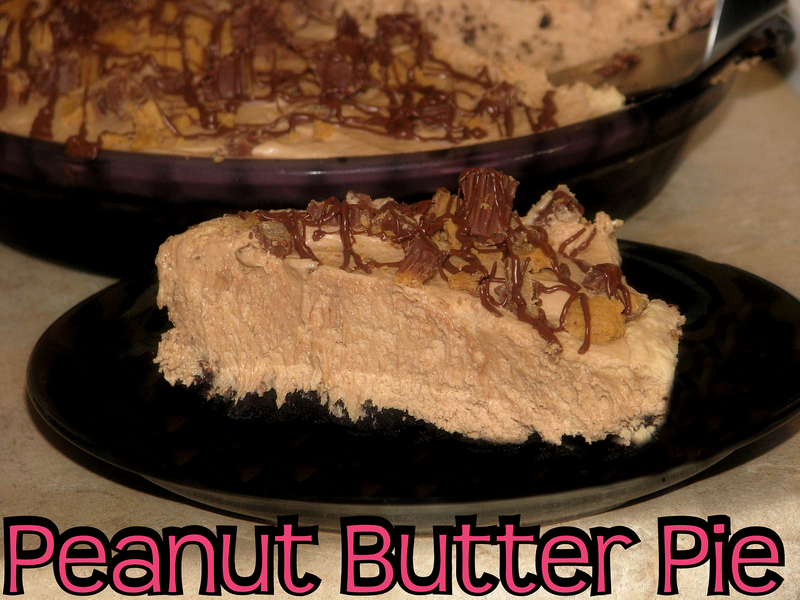 I stopped the world for just a few hours, took extra time to laugh, kiss, hug and dance with hubby and made a Peanut Butter Pie in Mikey’s Memory to share with someone special in my life. My Husband. I thought of Jennie and her daughters as I made the pie today. I wondered how they were doing and I prayed for them. Just remember Today is a gift….Tomorrow’s a Chance. Let the people you love, know that you love them. Hug them just a little bit longer, and remember to say “I love you”. You never know if that will be the last time they get to hear it. Preheat oven to 350F. Place all of the oreos into a large sealable bag. 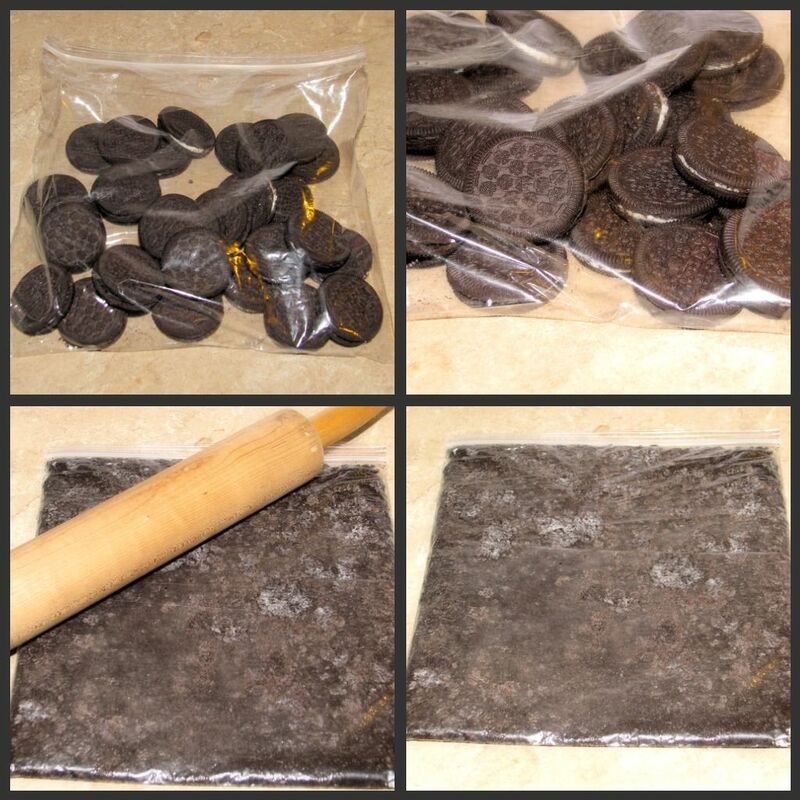 Crush the Oreos using a rolling pin until they are fine crumbs. 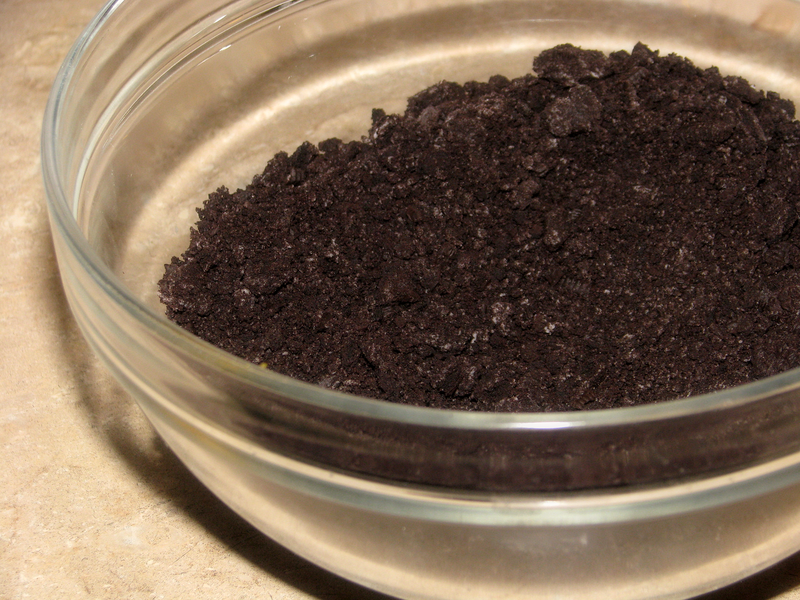 Pour Oreo crumbs into a large bowl. Melt the butter. 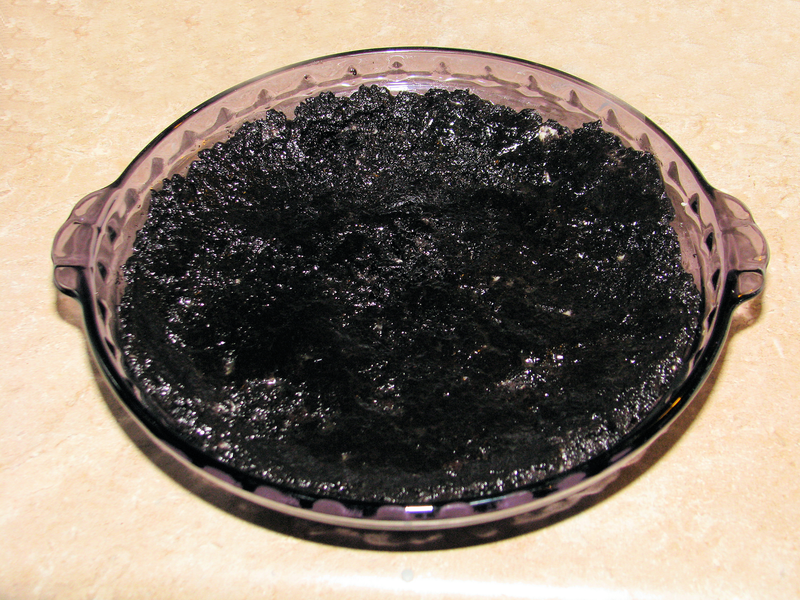 Pour the melted butter over the Oreo crumbs and stir to combine. Press into pie pan and bake at 350F for about 15 mminutes. Chop 7-8 mini resses cups and sprinkle over the bottom of the pie crust, while the crust is still super hot. Let them sit for about 30 seconds, and then take the back of a spoon and smooth them out onto the crust. In a stand mixer, (or using a hand mixer and a large bowl) mix 1 cup of peanut butter with the 8 oz of cream cheese until smooth. Add 1 1/4 cups of powdered sugar. Mix Well. Add in the thawed Cool Whip and mix until smooth. Mix in 1/4 cup Nutella. Mix for about 1 minute, until everything is well incorporated. Pour filling into crust, use a spatula to smooth out the top. 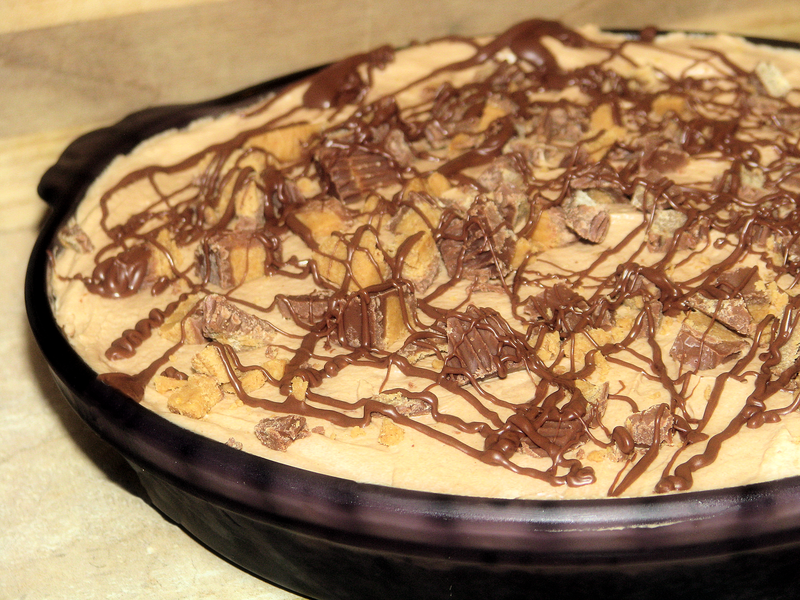 Chop More Reese cups and sprinkle them over the top of the pie. Take the 4 tablespoons of Nutella and melt in the microwave for about 30 seconds. Pour the melted Nutella into a ziplock bag, snip off one end of the bag, and drizzle the Nutella over the top of the pie. Stick the pie into the fridge and let chill for about 3-4 hours.